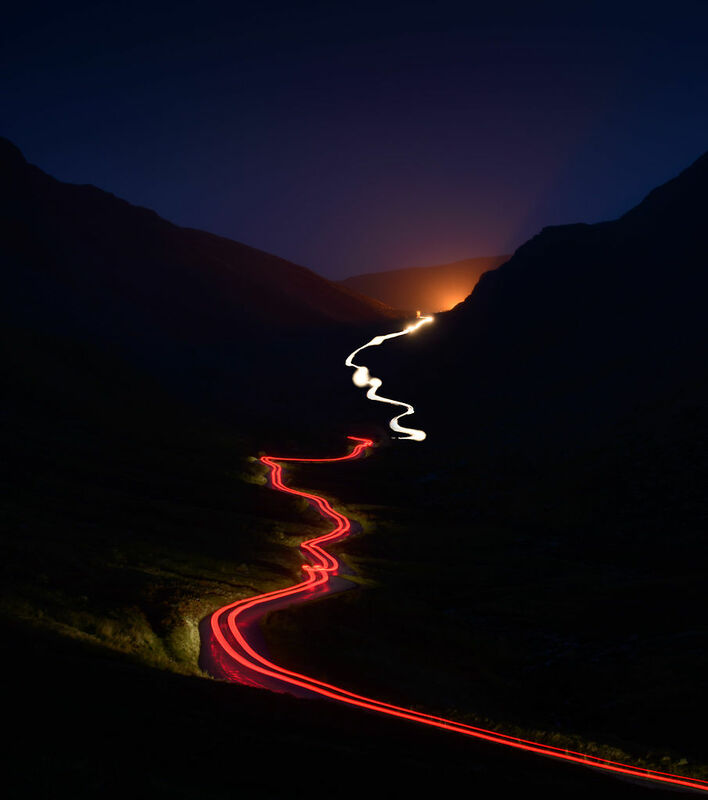 You’re looking up the Honister Pass from the Buttermere side, and the lights at the top belong to the quarry. It’s a scene I’ve shot in daytime with the light coming down the valley and picking out the curves of the wet road, but the idea of shooting it at night has been in the back of my mind for a while. Usually in the evenings I just want to eat, read, review the day’s pictures, nip to the pub. In November though it was getting dark well before pub time and it was also very mild for the time of year, so this was an ideal opportunity to get the shot. The first attempt didn’t turn out too well. The light trails were soft, and I’m unsure if it was because a tripod leg may have been slightly loose or because I was finding it too dark to focus with the Fuji. But helped me work out the rough exposure time – and prepare for long waits between cars. It’s a combination of two 75 second exposures with my Nikon D800. I had already been waiting half an hour before a car appeared. It headed up the valley and then stopped half way, so that was the end of the first exposure. Almost immediately another car started coming down and this second exposure stopped just before the white headlight trails reached the red ones left by the first car’s rear lights. I did take another exposure which recorded the second car as it came all the way down, but I prefer them this way.